Quiche is one of those breakfast foods that you could eat any time of day. It's the most comforting, cozy slice of heaven. This Sausage and Onion recipe is my favorite. In a medium skillet, melt butter over medium heat. Saute sausage, garlic and onion in butter until lightly browned, about 10 minutes. Use spatula to break up sausage and cook thoroughly. Stir in 1/2 cup Cheddar cheese. Season with salt and pepper. Spoon mixture into pie crust. In a medium bowl, whisk together eggs and milk. Season with salt and pepper. 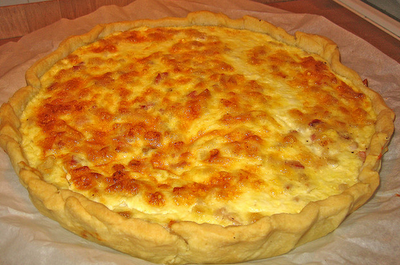 Pour into the pastry shell, allowing egg mixture to thoroughly combine with sausage mixture. This is my mom's Christmas morning breakfast recipe....I can't wait to make it again this year... delish!